Power amplifiers (PAs) ensure that the source radio frequency (RF) signal, such as a DVB, 3G, LTE, or 4G signal, is powerful enough for transmission. Because PAs use a fixed supply voltage, they draw maximum power whatever the amplitude of the signal, making them notoriously inefficient for amplitude modulated RF signals. Envelope-tracking technology can double a PA’s efficiency from 30% to 60% or more by dynamically modulating the amplifier’s supply voltage according to the RF signal passing through the device. Nujira’s High Accuracy Tracking (HAT™) technology, the first practical implementation of envelope tracking, is being used or evaluated for cellular infrastructure and terminals, broadcast transmitters, military communications and other applications. It is featured in three product lines: Coolteq.L for mobile handsets, Coolteq.h for cellular base stations, and Coolteq.u for DVB transmitters. We used MathWorks tools across the entire development life cycle of these product lines, from research, through modulator design, to verification and automated testing. Conventional PAs waste as much as 80% of the energy they consume as dissipated heat. The PAs in a cellular base station, for example, account for half the total power consumed. Figure 1. Left: Power amplifiers with a fixed supply voltage. Right: Supply voltage modulated using envelope tracking. Although it was first described more than 60 years ago, envelope tracking has not been applied commercially until recently, largely due to the difficulty of implementing a power supply modulator that meets the efficiency, bandwidth, and noise requirements of wideband signals such as multicarrier WCDMA, WiMAX, or DVB. Nujira’s envelope tracking technology can double the efficiency of PAs and dramatically reduce power dissipation, which lowers energy bills and substantially reduces the amount of cooling required (Figure 1). It also enables higher device output power, allowing broadcasters to extend the range of existing broadcasting towers. Lastly, the wide-band operation of Nujira’s technology enables broadcasters to use fewer PA designs to cover their target broadcast spectrum. 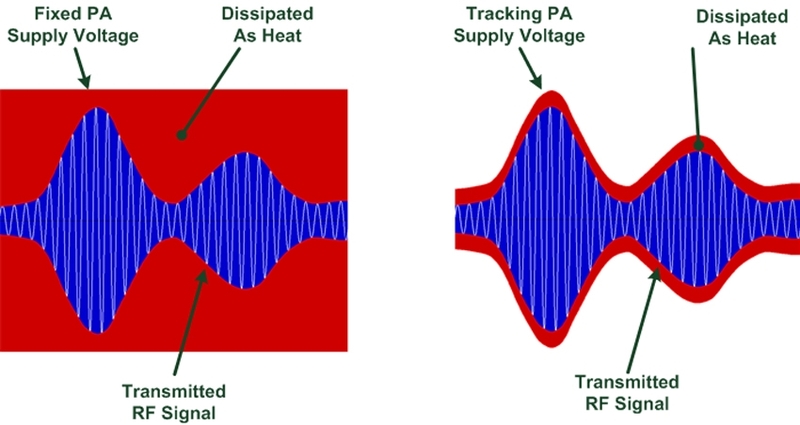 To implement envelope tracking, a modulator must keep the amplifier operating at its most efficient point by changing the PA’s supply voltage in phase with the transmitted signal. For a base station transmitting a modulated signal with a 40 megahertz (MHz) envelope, for example, the supply voltage of the PA must be changed at a frequency of at least 40 MHz, and it must be precisely aligned with the transmitted signal. In the product design phase, we used Simulink®, Communications System Toolbox™ and Control System Toolbox™ to model the key power modulator circuitry and then ran simulations to project the performance of various modulator designs. The modulator model included key circuits, such as the switch mode power stage and linear correction amplifier. Simulating the operation of the modulator from the raw envelope input to the processed envelope output enabled us to predict the modulator’s efficiency and tracking accuracy. We then used the simulation results to verify the performance of the manufactured product. Modulating the gate voltage of the PA’s transistor in real time distorts the transmitted signal, an effect that can be corrected using digital predistortion. Our digital predistortion algorithms are applied within the transmission chain to produce a linearized output that meets adjacent channel power (ACP) requirements for all relevant standards. We developed and tested floating-point versions of the digital predistortion algorithms using MATLAB® and Signal Processing Toolbox™ and then converted them to fixed point using Fixed-Point Toolbox™ in preparation for implementation on an FPGA and DSP. We developed a set of test inputs and expected outputs to validate the algorithms before implementing them in hardware.Later, we reused the same test vectors to verify that the hardware produced the same results as the fixed-point MATLAB implementation. In the first phase of validation, we used a test configuration that included a test baseband, the modulator, and a large resistive load. The validation bench comprised digital multimeters (DMM), power supplies, and an oscilloscope (Figure 2). All the equipment was controlled using MATLAB and Instrument Control Toolbox™, typically via Standard Commands for Programmable Instruments (SCPI) over a GPIB bus. The test team captured a range of 2G, 3G, LTE, and TDMA test signals using an Agilent MXA signal analyzer and then used MATLAB to perform crest factor reduction on the signals to prepare them for use in the test environment. Figure 2. The 2.1GHz RF validation test bench. In the next round of validation, we replaced the resistive load with an actual PA and added a spectrum analyzer and two USB power meters to the validation bench. With this configuration we can test the full RF setup. The development kit that we provide to potential customers contains this same RF setup. It includes the Coolteq Development System and a standalone MATLAB application with a graphical interface that enables customers to control every aspect of the tests (Figure 3). Figure 3. Left: Waveform analysis display generated from the MATLAB based Coolteq Development System. 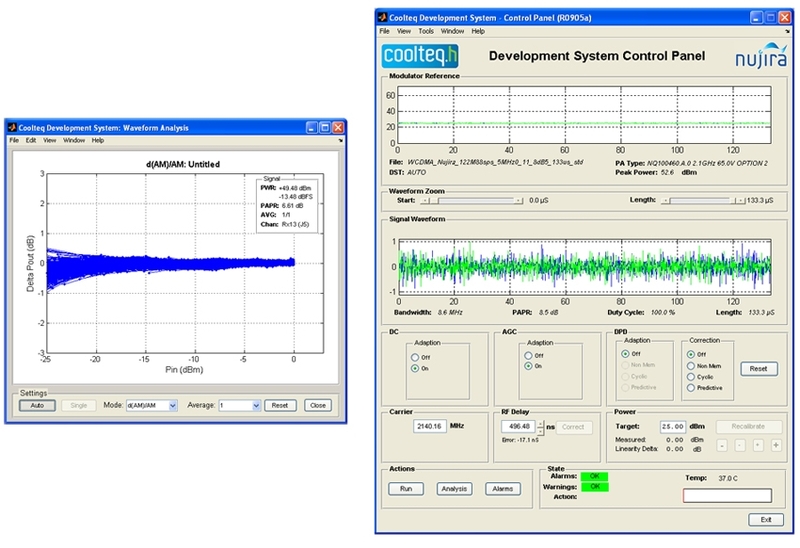 Right: Coolteq Development System control panel. The Nujira testing team has built an automated test equipment (ATE) system for the complete baseband, modulator, and PA chain. 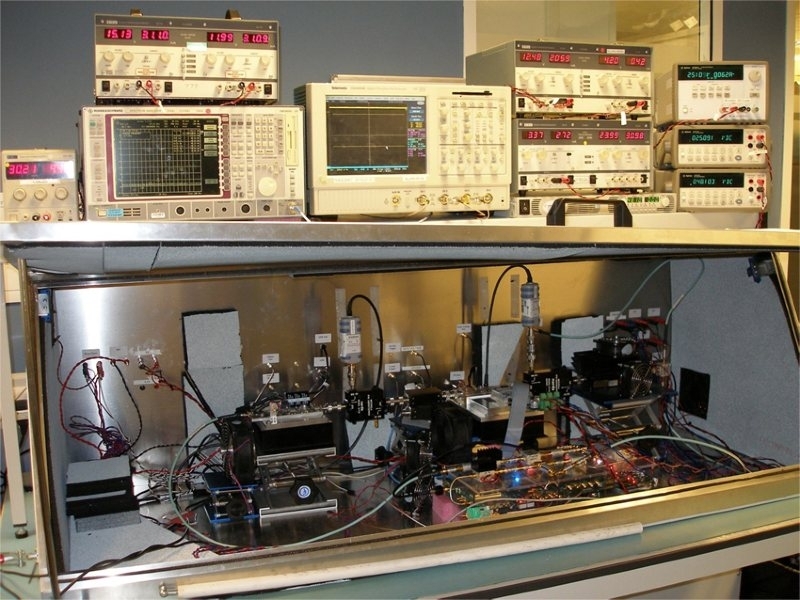 The test setup includes multiple power supplies, power meters, and DMMs, in addition to an oscilloscope and spectrum analyzer (Figure 4). The setup enables us to swap out the baseband, modulator, or PA to quickly evaluate a new design. We use MATLAB to drive the automated tests and control the test instruments. We capture waveforms from the scopes and baseband receivers and then run MATLAB scripts to analyze the performance of the entire system at various operating points, including a range of voltage rails, and at temperatures between -40 to +60 degrees Celsius. Figure 4. Nujira’s automated test equipment setup for system-level validation. A typical test run for one RF waveform requires about 50 measurements. Because manual testing requires the engineer to set up registers for each test, a single run could take several hours to complete manually. With our ATE, engineers can complete a single run in several minutes and a full regression test for 10 waveforms in 45 minutes. Moreover, the results from the ATE are much more consistent and repeatable than the manual test results. The MATLAB based ATE has saved Nujira more than £1million in manual testing costs to date. The Coolteq.h product line is already in production, and we are now testing the first Coolteq.L chips for mobile handsets. 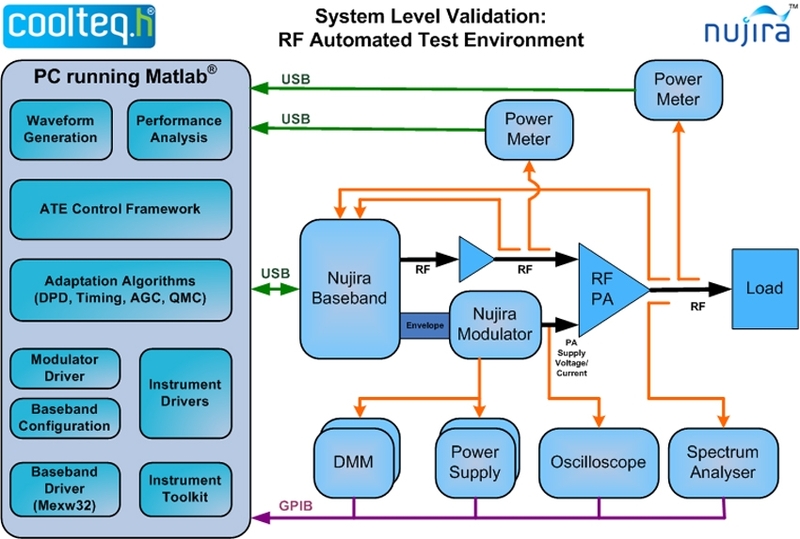 MathWorks tools have helped Nujira bring these products from raw research to production systems, and have enabled us to develop a complete ATE system for component- and system-level testing.